The RARE-Bestpractices work plan is organized in 8 distinct yet strategically integrated Work Packages (WP). 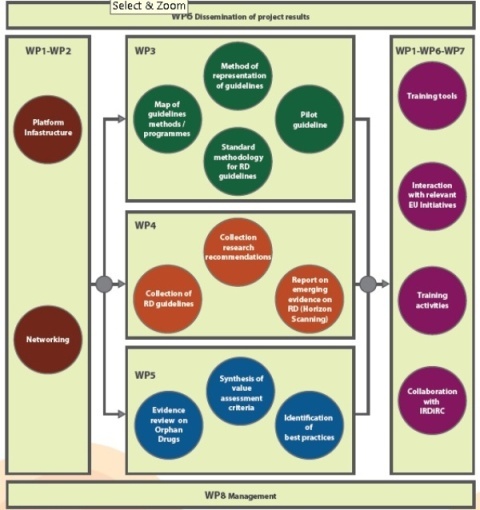 WP1 is dedicated to the scientific coordination of all activities and to ensure a proactive and synergistic collaboration among partners and other stakeholders. It is also responsible for the organization of training activities. The technical infrastructure of the platform will be designed in WP2, in order to allow collection, management and dissemination of data and documents as well as interactions among partners. Two databases (best practice guidelines and research recommendations), populated according to criteria defined in WP4, will be reached from a single point of access. WP3, WP4 and WP5 are at the core of the project. More specifically, WP3 is responsible for leading work to reach agreement on the methodology for the development of guidelines on rare diseases. WP3 will then define and formalize the methodology as a documented procedure. To test the standard methodology reached, a pilot guideline for a specific rare disease will be developed, complemented by its version for patients and their families. The pilot guideline will then be implemented using an innovative methodology for the effective inclusion of clinical recommendations in a possible information system to assist health professionals in process execution and to allow performance analysis and economic evaluations. WP4 is dedicated to collecting existing guidelines and research recommendations currently scattered in various rare diseases databases and websites and making them accessible through a single point of access. Defining criteria for establishing the collections and the evaluation will be the first activity. WP5 is responsible for collecting and evaluating orphan drug appraisals in selected EU MS, in order to map out the current processes of EBM (Evidence Based Medicine) and CEA (Cost-Effectiveness Analysis) for orphan drugs and identify and compare current practices among the study countries. WP6 will guarantee a dissemination plan aimed at sharing project activities and outcomes with relevant stakeholders. WP6 is also designed to create fruitful interaction with relevant EU initiatives such as EUCERD joint action to assure that project outputs will be embedded into health care policies for the benefit of RD patients. WP7 is dedicated to strengthening the collaboration between IRDiRC and the RARE-Bestpractices Consortium in order to exchange results and information and support IRDiRC mainly in the development and sharing of best practice and in the effort to minimize unnecessary redundancy in research. WP8 is responsible for ensuring the smooth running of the actions monitoring the project in administrative, financial and technical terms.